Recognition of various targets by CTL clones derived from TIL586. CTL clones were isolated by the limiting dilution method and were further expanded. 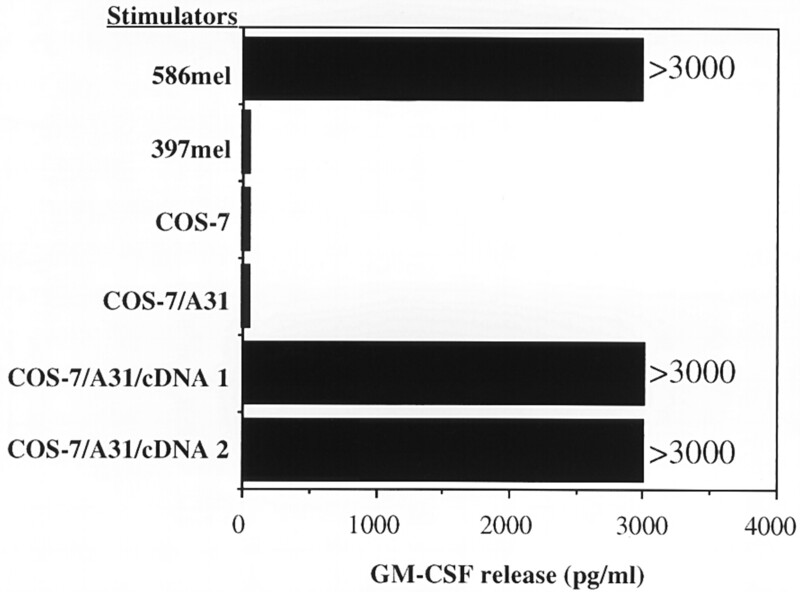 A, GM-CSF release by CTL clone 4 was measured after coculturing with different target cells. B and C, In a separate experiment, GM-CSF release by CTL clones 5 and 10 was determined after coculturing with different stimulators. NHEM680 is a HLA-A31-positive normal melanocyte cell line, 397mel is an HLA-A31-negative melanoma cell line and 586mel is an HLA-A31-positive melanoma cell line. Isolation of cDNA clones encoding a tumor Ag recognized by CTL clone 5. GM-CSF release by CTL clone 5 was measured after coculturing with 586mel, 397mel, COS-7 alone, COS-7 transfected with HLA-A31, or COS-7 transfected with HLA-A31 plus cDNA clones 1 and 2, respectively. 586mel and 397mel were used as the positive and negative controls. Nucleotide and amino acid sequence of NY-ESO-1. A, Numbering of nucleotide sequence of NY-ESO-1 starts from the first nucleotide in the 5′ untranslated region. ORF1 represents the gene product of NY-ESO-1, and ORF2 represents a 58-aa gene product translated from the ORF2. Antigenic peptides recognized by CTL clone 2 and 5 are boxed. In addition, a peptide poorly recognized by CTL clone 5 is underlined. B, Sequence alignment of the ESO-ORF1 protein with enterobactin synthetase component F (GenBank accession no. g250614) and tegument protein of herpes simplex virus type 1 (accession p10220). The residues are numbered with the first start site representing the first amino acid. Alignment of the ESO-ORF2 and glutamate dehydrogenase (accession g1942184) was also shown. The conserved amino acid substitution is indicated by the + symbol. 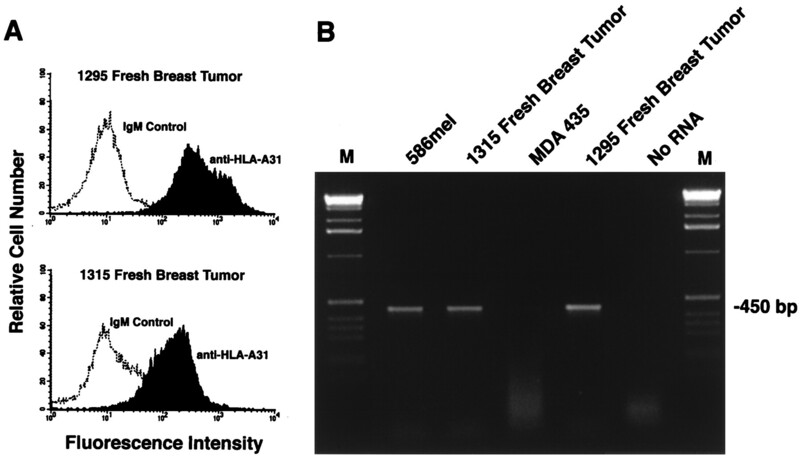 FACS analysis of HLA-A31 expression and RT-PCR detection of NY-ESO-1 in two fresh breast tumors. A, 1295 and 1315 fresh breast tumors were stained with anti-HLA-A31 Ab. After washes, the second goat anti-mouse IgM-FITC was used for FACS analysis. An isotype IgM control Ab was used for negative control. B, Expression of NY-ESO-1 was detected by RT-PCR using primers ESO-P2 and ESO-P5 in both 1295 and 1315 fresh breast tumor cells. RNA from 586mel was used as a positive control, and MDA435 RNA and no RNA were used as negative controls. PCR products were separated on a 3% agarose gel and stained with ethidium bromide. One-kilobase DNA markers (Life Technologies) were loaded on both sides. Characterization of the 9-mer ESO9-54 and 10-mer ESO10–53 derived from the normal open reading frame. A, 586EBV or 1510EBV B cells were pulsed with ESO10–53 and ESO9-54 peptides at different concentrations for 120 min. After two washes with AIM-V medium with 120 IU IL-2, CTL clone 5 (1 × 105/well) was added and incubated for 18 to 24 h. GM-CSF release by CTL clone 5 was determined by ELISA. 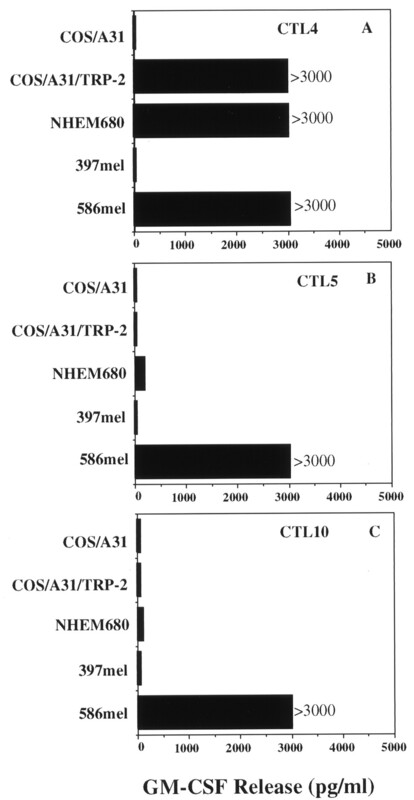 B, 586Mel cells were lysed by CTL clone 5, but 397mel cells were not lysed by CTL clone 5 at different E:T ratios. C, 586EBV and 1510EBV B cells were labeled with chromium overnight. The ESO10–53 peptide was then pulsed on the chromium-labeled 586EBV, 1510EBV, and T2 cells for 120 min. 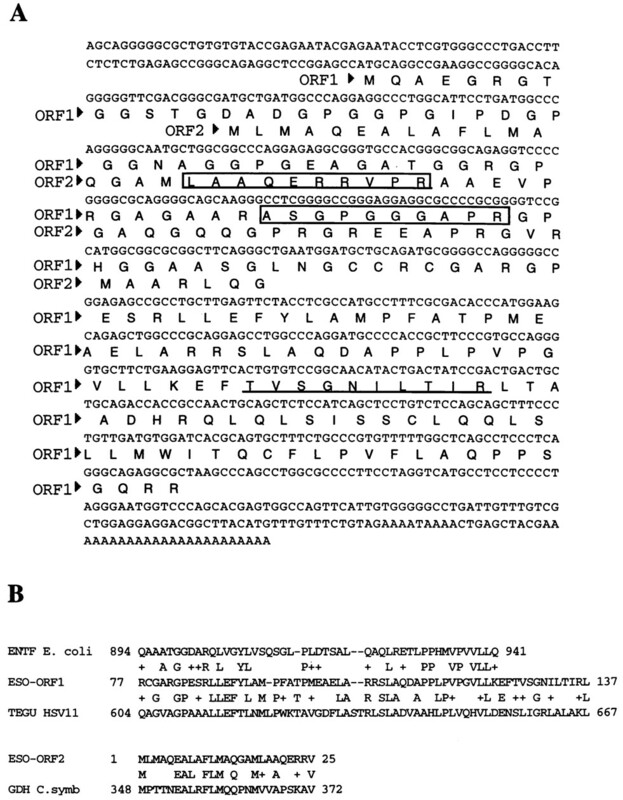 An irrelevant peptide containing an HLA-A31 peptide-binding motif was also pulsed on chromium-labeled 586EBV, 1510EBV B cells as negative controls. After peptide incubation and two washes, cytolysis of target cells by CTL clone 5 was determined in a 4-h chromium release assay. T2 pulsed with the ESO10–53 peptide was used for the specificity control. CTL clones 2 and 14 recognize the NY-ESO-1 gene, but not the ESO10–53 peptide derived from the NY-ESO-1 protein. CTL clones 2, 14, and 5 recognized NY-ESO-1 when cotransfected with HLA-A31 cDNA into COS-7 (left panels). TIL1244, which recognized TRP-2 but not NY-ESO-1, was used as a specificity control. On the right panels, CTL clones 2, 5, 14, and TIL1244 recognized 586mel. However, CTL clones 2 and 14 did not recognize the ESO10–53 peptide, whereas CTL clone 5 strongly recognized the ESO10–53 peptide when pulsed onto HLA-A31-positive 586EBV B cells. TIL1244 recognized the TRP197–205 peptide derived from TRP-2. 586EBV B cells alone or pulsed with the ORF3P peptide from an alternative reading frame of TRP1 were negative controls. 397mel is an HLA-A31-negative, NY-ESO-1-positive tumor line. An alternative open reading frame of the NY-ESO-1 gene and antigenic peptides recognized by CTL. A, Identification of antigenic peptides from the ORF2. Thirty peptides were synthesized based on all potential ORFs and screened. Representative data are shown here. Seven peptides derived from ORF2 (see Fig. 3) were pulsed on HLA-A31-positive 1510EBV B cells and tested for T cell recognition based on GM-CSF release. 1510EBV alone was used a negative control. B, 1510EBV B cells were labeled with chromium for 2 h. The ESORF2-10–18 peptide was then pulsed on the chromium-labeled 1500EBV (solid square) and HLA-A31-negative 1102EBV (open circle) at different concentrations. 1510EBV pulsed with ESO10–53, which was recognized by CTL clone 5, was used for the specificity control (solid triangle). After peptide incubation and three washes, cytolysis of target cells by CTL clone 2 was determined in a 4-h chromium release assay at an E:T ratio of 20:1. C, Several tumor lines and fresh breast tumors were tested for recognition by CTL clone 2 to determine whether the ORF2 is translated in different tumors. 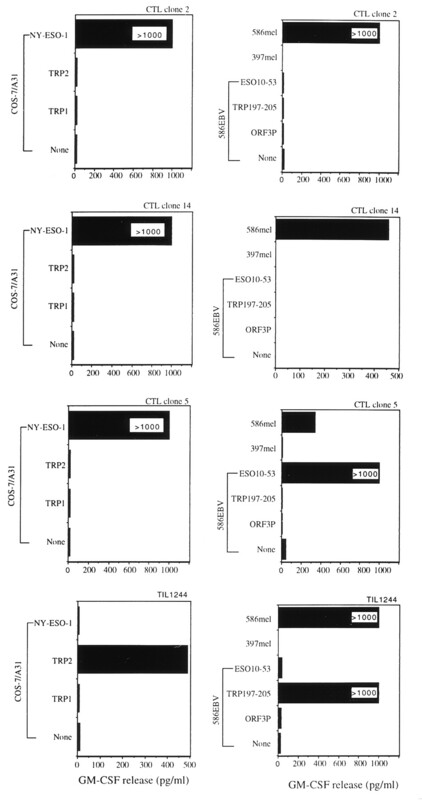 1510EBV B cells pulsed with ESO10–53, ORF2-10–18, or alone were included to evaluate the reactivity and specificity of CTL clone 2 and 5. Expression of HLA-A31 on the tumor cells is indicated. a GM-CSF in the supernatant was measured after a 24-h incubation of 5 × 104 CTL clone 5 or 10 cells with melanoma cell lines. a IFN-γ in the supernatant was measured after an 18-h incubation of 1 × 105 CTL clone 5. In experiments 1 and 2, cytokine release from stimulators alone was <10 pg/ml. a 1510EBV B cells were incubated with individual peptides at a concentration of 0.1 μg/ml for 90 min. 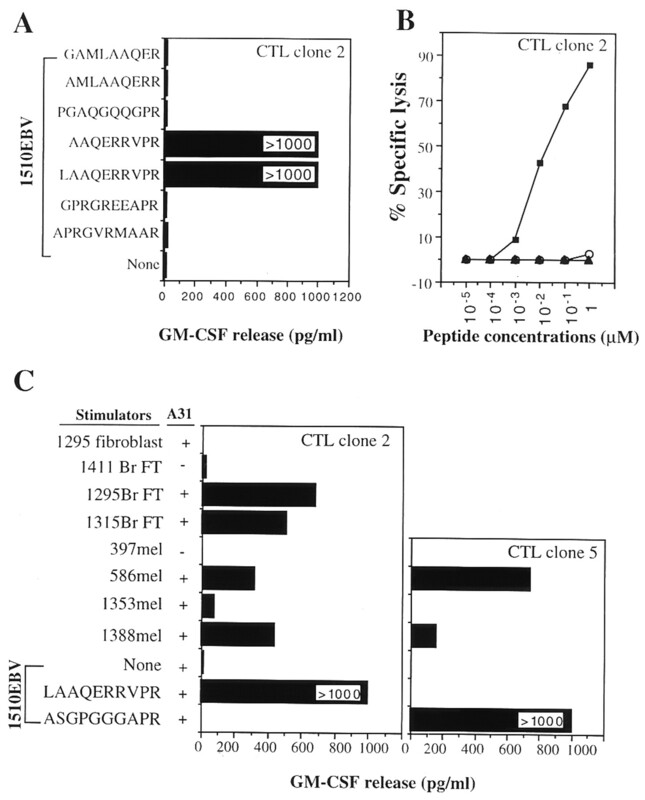 GM-CSF release was measured after coincubation of peptide-loaded 1510EBV cells with CTL clone 5. 1510EBV is an EBV-transformed B cell line expressing HLA-A31.